After being abandoned by their police force and government in 2006, Caledonia residents awoke today to learn that their neighbours in Simcoe voted to damn them to 4 more years of suffering with an MP who is perhaps the most useless and apathetic in the history of our Country. Thousands of people dared to believe that their voice could make a difference by voting for Gary McHale, but Simcoe which has not yet suffered at the hands of Native terrorists and a crippled OPP voted to hand the status quo another term and a gold plated pension. Lest there be any doubt that Diane Finley is a desperate woman whose campaign has gone up in flames, we have confirmation today that she is skipping yet another debate (this time shunning the Rotory club in Simcoe) to spend the day travelling around Caledonia with the minister of finance Jim Flaherty. Hopefully someone will think to ask him about the $0 he has given to the businesses and residents of Caledonia and the millions given to the OPP to nap in their cars for the past 2 ½ years. Just in case sauntering around with Flaherty isn’t enough to blind voters to the fact that she abandoned them as soon as the going got tough, a plane carrying Prime Minister Stephen Harper is scheduled to land at Mount Hope airport tomorrow. Perhaps while Harper is trying to schmooze with the little people in this riding, someone can ask him where he’s been while the residents of Caledonia have been under attack. For the second time in as many debates, Diane Finley decided not to show up today to an all candidates meeting held by the Hamilton Spectator and televised throughout Haldimand Norfolk to her constituents. I must say that as a constituent I’m beginning to question her dedication to this job. I touched recently on the impression I received from Dr. Hoskins that he’s not someone who would be able to lower himself to the level of the common constituent, and should point out that having spoken with and volunteered for Diane Finley in the last election, I know her to be incapable of it. That’s not coming from an impression or a theory, it’s personal experience with her. It’s been only 7 days since Gary McHale became a certified Independent candidate in Haldimand Norfolk, but Diane Finley has already made it clear she sees him as a major threat to her ambitions of being re-elected. After Haldimand Mayor Marie Trainer told the Simcoe Reformer that “McHale’s candidacy guarantees that the rest of the field would have to talk about Haldimand’s ongoing problems related to native land claims”, Finley confronted her in what I as a voter would interpret as an effort to silence one of very few legitimately objective voices. It’s understandable that Finley was riled by the mayor’s comment however as she likely realized at that point that McHale will force her to answer for her complete failure as an MP to the people of Haldimand Norfolk. Indeed if I were Diane Finley I too would be terrified of Gary McHale as his platform of accountability will make her policy of lying to the people and then hiding from them quite difficult to maintain during an election. Is Diane Finley a liar? With a Federal election just 5 weeks away, I received what I presume to be the first campaign literature from Diane Finley this week. 2 flyers arrived asking me to reply to 2 questions. Who is on the right track on child care, and who is on the right track on the long gun registry? I’m given the choice of Stephane Dion, Stephen Harper, Jack Layton, or Elizabeth May, but I’m told to reply to a big smiling picture of the Minister of Immigration Diane Finley. 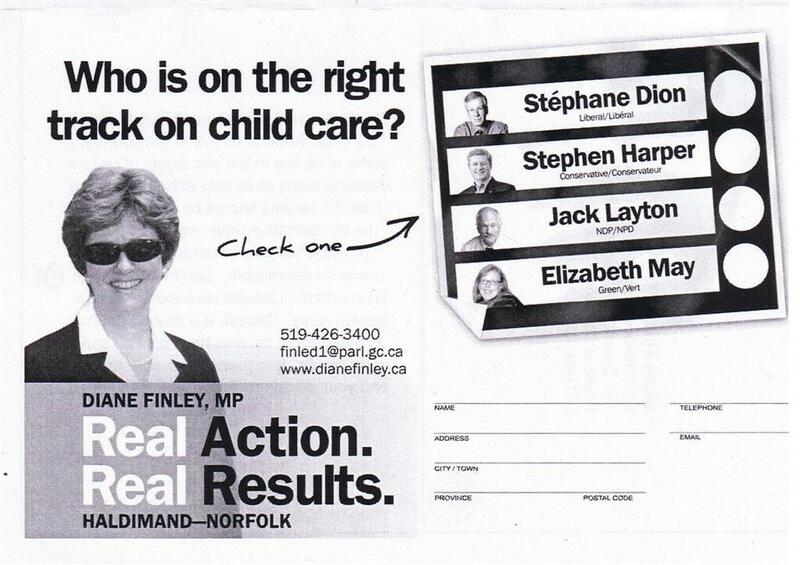 The slogan “Real Action, Real Results” then appears underneath Finley which forces me to wonder aloud, what action has she taken for Haldimand or Norfolk since becoming our federal representative, and what results has she achieved for us? She’s very clearly implying that without Gary McHale, the other candidates would simply ignore the critical issues facing Haldimand County, and this is coming from a Mayor who has had plenty of dealings with Diane Finley over the past 2 ½ years, so she has some insight into the thought process of the PC candidate that the rest of us do not as nobody has been able to meet or speak with her about Caledonia.